LONDON, England — Ready to spend a Saturday exploring the city, we found no shortage of fascinating places to visit. 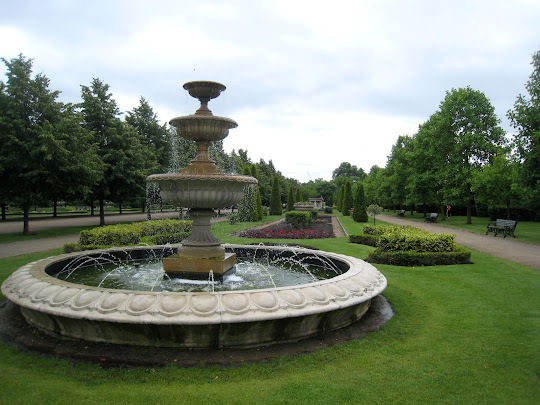 Our day began at Regent's Park, which happens to be near our hotel and where we hoped to plant a letterbox. One of the Royal Parks of London, Regent's was once a hunting park for Henry VIII. Subsequently leased for farming, it was formalized into a park in the early 1800s at the direction of King George IV. Today a variety of sports are played in the 410-acre park, and several public gardens are meticulously maintained. In addition to the formal Italian garden and the informal English garden, perhaps the most popular spot is Queen Mary's Garden, the most carefully tended section of the park. 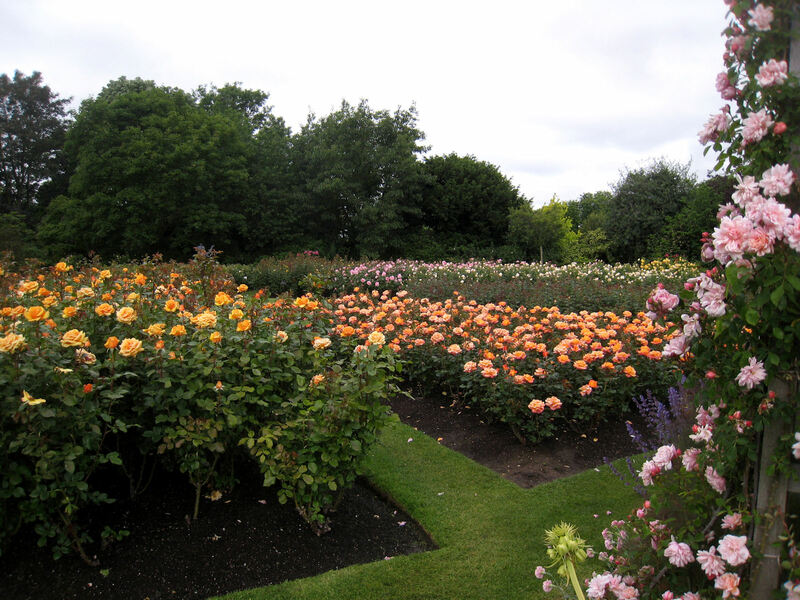 Named for the wife of King George V, this world-famous rose garden exhibits in excess 30,000 rose plants of more than 400 varieties. We are not particularly fans of roses, but the ones we saw today and yesterday at Hyde Park's rose garden were spectacular. Every imaginable color and variation were represented in these stunning collections. Who wouldn't feel rosy after visiting these amazing specimens? 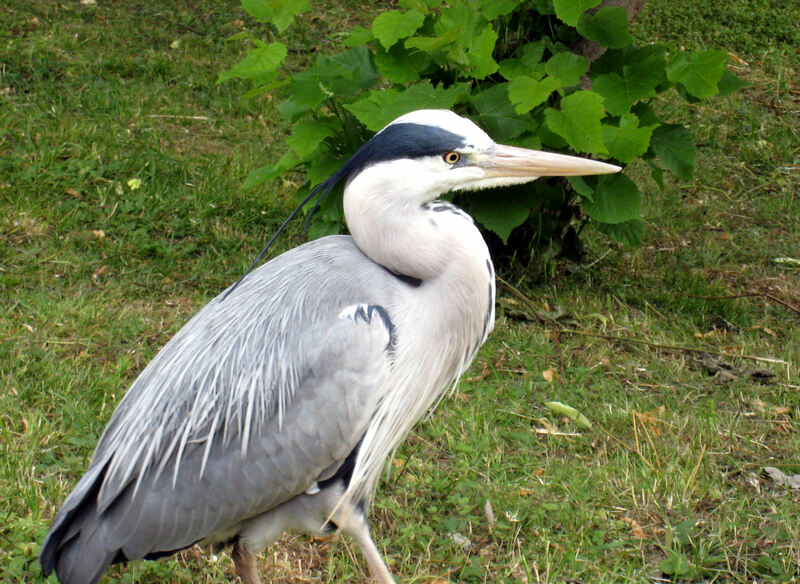 Before leaving Regent's Park, we had a chance encounter with some of the park's endless array of wildlife. In particular we observed a sizable colony of grey herons living in the lake area. Most fascinating was the family of coots who approached when we walked slowly by the lake. Apparently these birds have become pretty desensitized to humans, especially when they think some snack or treat may be forthcoming. 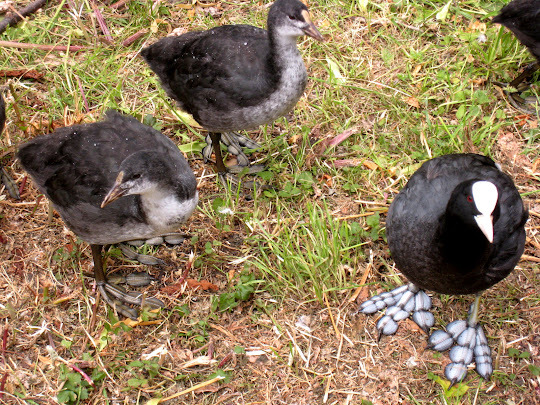 The frontal coloring on the forehead is a primary feature of the coot, as are the semi-webbed feet. What an interesting evolution, giving this water fowl lots of diverse opportunities on both land and in water. The adolescent birds were sticking close to this adult. 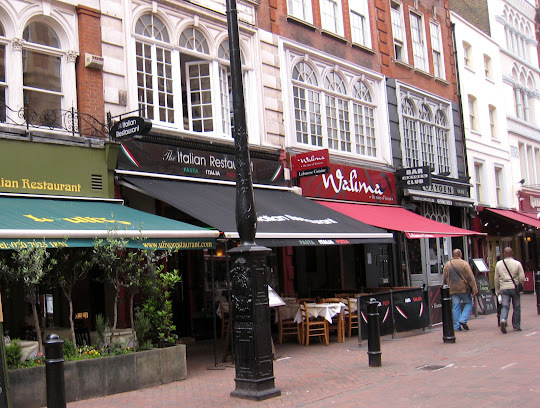 Leaving the wildlife behind, we took the subway to Leicester Square where we scored a couple of tickets for a play tonight and had lunch at Walima, a new Lebanese restaurant on the square. The food was delicious, and the service exceptional. After lunch, we visited Big Ben at Westminster and walked across Westminster Bridge to search for a couple of letterboxes which we were unable to find. The boxes were hidden in very open areas and we suspect they fell victim to "muggles" who thought they were trash and threw them away. We found the 21-acre Southbank Centre in the midst of a four-month long celebration commemorating the 60th anniversary of the Festival of Britain. 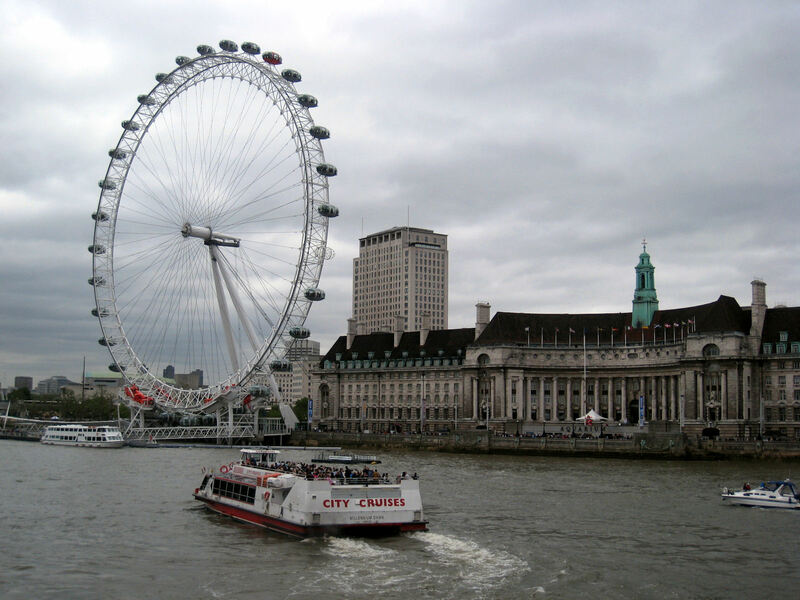 Visitors thronged the Sea Life Aquarium and the London Eye, the city's 443-foot ferris wheel. Street performers were busy plying their trade, from magicians to acrobats. 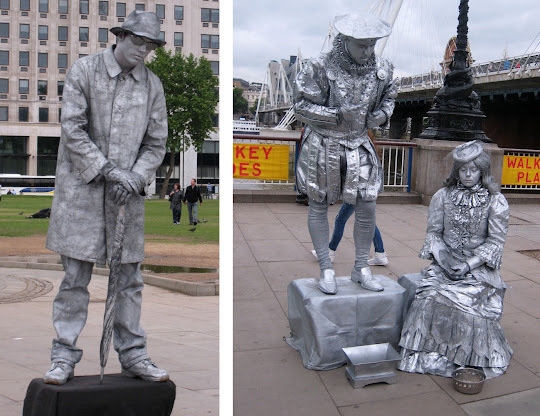 But the human statues were among the most popular. 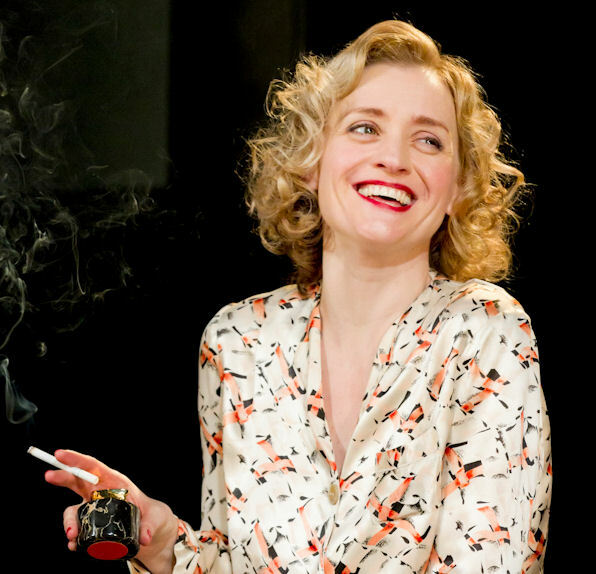 Our day ended at the Old Vic Theatre with a performance of Cause Célèbre, a drama based on a true story of a woman accused of conspiring with 18-year-old boyfriend to murder her husband in 1935. 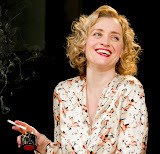 We found the play quite entertaining, especially the riveting performance of Anne-Marie Duff, who played the lead. It was a fitting end to our rosy, festive lark of a day in London.